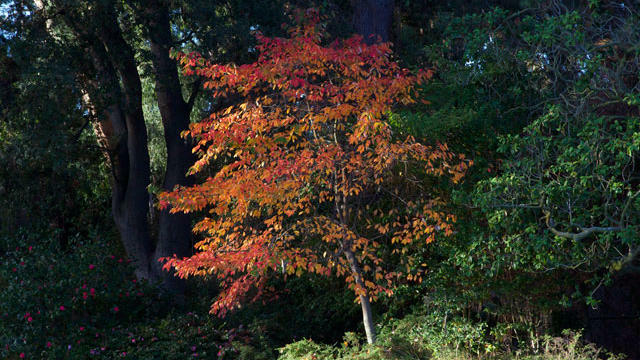 This morning I arrived at Sunset just as the autumn sun crested over the redwood trees and set ablaze the one tupelo tree we have growing in the garden. It was breathtaking. Tupelo (Nyssa sylvatica) is an awkward tree to grow in the drought-stricken West, as it needs a fair amount of water to thrive. It’s also unassuming during spring and summer, with dark leaves and no flowers, so many people might not consider it for their gardens. But I’ve always admired its fall colors: brilliant yellow and orange leaves that eventually glow scarlet, and the dark ladderlike branches that glisten in our infrequent winter rains. Our gardens are always gorgeous and open to the public Monday through Friday, 9:30 a.m. to 4:30 p.m. 80 Willow Rd., Menlo Park.